Happy Wednesday, friends! I hope you and your fur-babies are well. (If you have some.) We have been nursing our dog, Lacey, back to health after a nasty ear infection, which led to a few hot spots on her face. Here are a few tips for hiding medicine for dogs in order for them to take their pills! Although I am not an expert nor a vet, I feel like I am an expert when it comes to Lacey, our 8 year old Golden Retriever. After 8 years together, we pretty much know how each other reacts to certain things and what to expect. We also know when Lacey is not quite herself or not feeling well. Recently, we took Lacey to the groomer. They bathed her and trimmed her hair and nails. We think they inadvertently got some water in her ear because when she got home she was shaking her head and rubbing her ear on the ground. A sure sign of water in her ears since also does this after she goes swimming. So, I cleaned her ears out with the ear cleaner from the vet and the next day she went to her dog sitter while we went out of town for a few days. When we returned, Lacey had a full blown ear infection and a hot spot on her face from scratching. (Through no fault on her sitter’s behalf.) The spots on her face were raw and bloody. We took her to the vet the first thing next morning and it was already worse. He shaved the area of hair so we could better monitor it and keep it clean. He prescribed a long round of antibiotics, an anti-inflammatory, and an anti-anxiety pill to keep her from scratching and being nervous. We knew getting her to take all of these pills was going to be a challenge, to say the least. This is how she looked when we brought her home. So pitiful. I know it was painful too. Here are a few things we attempted to hide the medicine in treats for Lacey. First, we tried placing the pills in a piece of American cheese and folding it up. This worked for a few days, but then she grew wise to the pills and would spit them out and eat the cheese. Next, we tried a thin piece of bread with peanut butter and rolled the pills inside like a burrito. This also worked for a few days. Then, she refused to eat anything with a pill inside. Stuff the pills in the hole and wallah! A DIY hide-a-pill treat! Lacey was a little suspicious at first of the Vienna Sausages since she’d never had one before. I gave her one without a pill at first so she could taste test it and she LOVED it. Then I gave her one with a pill and she gobbled it up! Fingers crossed this will work for the next few days so she can finish her round of antibiotics. I made up a batch of pill pockets for the remainder of her meds and put them in a container in the fridge. Now, after she eats her meals, I’ll sneak the pills inside and she won’t be the wiser. You can try this for your pets, or you can also buy specially made hide-a-pill treats such as these Pill Pouches from Milk-Bone. I haven’t tried these yet, but may need to if my Vienna Sausage trick seems to wane after a few more days. Dogs are smart! Here is another Pill Pop alternative by Zoe. These can be ordered on Amazon or found at your local Pet Superstore for around $6 per pack. Maybe if I mixed up the treats and other tricks it might be more interesting for Lacey and she wouldn’t spot the pills so easily? I am by no means an expert, so of course consult your vet before proceeding with any medicines or treatments. I am happy to report Lacey is on the mend and feeling much like her old spunky self! 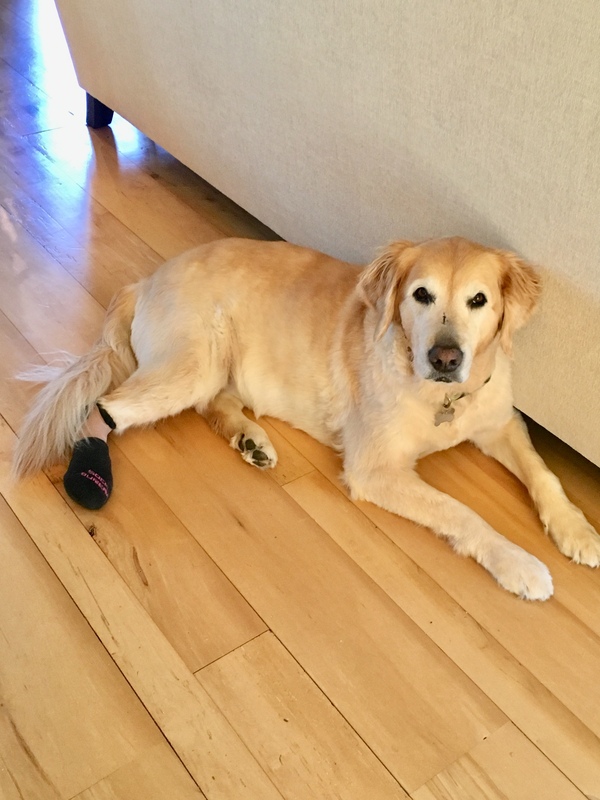 She still has the sock on her foot to keep her from scratching her face until it heals. (My idea, not the vet’s) So far this is working better than the comfort collar and she is more content. Is your pet a Sherlock Holmes of finding pills in their food or treats? Please let me know if you have a favorite trick that works with your pet. Hopefully this won’t happen again, but just in case, it’s good to know! Hobby Room Here I Come…Take Two! Addressing Envelopes…The Best Tool Around!